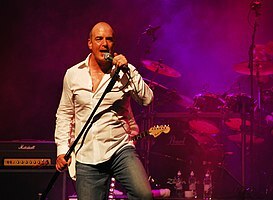 Peter John Cox (born 17 November 1955) is an English singer-songwriter, best known as the lead singer of the British pop duo Go West. Peter John Cox sang in his school choir and later as a chorister at The Chapel Royal, Hampton Court Palace. In his early twenties, he worked in a 'covers' band for The Mecca Organisation. While in residency in a Sheffield nightclub he began writing with longtime collaborator Richard Drummie, with whom he eventually signed a publishing deal. In 1982, Cox and West formed the band Go West, with Cox as lead singer and Drummie on guitar and backing vocals. After Go West signed a deal with Chrysalis Records, "We Close Our Eyes" became a Top 5 hit in the UK Singles Chart in 1985. Other Go West singles released that year included "Call Me" (1985) and "Don't Look Down". The following year, Go West was named 'Best Newcomer' at the 1986 BRIT Awards. In 1987, the band reached the Top 40 in the U.S. with the single "Don't Look Down – The Sequel". In 1990, Go West had a no. 8 hit in the U.S. with "King of Wishful Thinking" from the film Pretty Woman. In 1992, the duo released the Indian Summer album, which included "Faithful"; the song reached the Top 20 in Canada and the United States. Cox moved to Los Angeles in 1993 to pursue a solo career. His debut album Peter Cox was released in 1997 to critical acclaim. Subsequent CDs include Flame Still Burns (2001), Nine Miles High (2002), Desert Blooms (2002), Game For Fools (2005) and Motor City Music (2006). Cox also teamed up with Tony Hadley on the album Tony Hadley vs Peter Cox & Go West, released in 2004 and collaborated with Bernie Nolan on what was to be her final studio recording. In 2003 Cox replaced Then Jerico's Mark Shaw on the UK TV reality show Reborn in the USA after Shaw stormed off the series in the show's first few days. Even though Cox had achieved previous success across the Atlantic as the singer of Go West, he was able to appear on the show as he was unknown in the US as a solo artist. He was a favourite to win but was voted off in New York after he forgot the lyrics to the Norah Jones hit he was performing. In April 2010 Cox recorded The S1 Sessions. The album includes cover versions of Lonestar's song "Amazed" and the Leon Russell song "This Masquerade". In 2012 Cox released Riding The Blinds, an album of alt-country songs written by Nashville luminaries. His most recent CD is "Damn The Brakes", released in 2013. Cox's voice has been described as "smooth as silk[,] but with a gritty underbelly." ^ "Brit Awards Show History – 1986". Brit Awards. Retrieved 31 January 2012. ^ "The RPM Top 100 Hit Tracks of 1993". RPM. Library and Archives Canada. Retrieved 12 May 2018. ^ "Peter Cox Biography – ARTISTdirect Music". Artistdirect.com. 17 November 1955. Retrieved 23 February 2013. ^ Roberts, David (2006). British Hit Singles & Albums (19th ed.). London: Guinness World Records Limited. p. 124. ISBN 1-904994-10-5. This page was last edited on 1 April 2019, at 06:00 (UTC).